Each of the top four roses was done with a different Inktense pencil, then liquified. The bottom rose was permanent inked and then I added watercolor from my travel palette. Roses are much harder than marigolds. But I do enjoy the challenge. Speaking of challenges, I have a pretty sick kitty on my hands (kidney problems), and so if I miss a post here and there, or don’t get a chance to comment on your posts….you’ll know why. Prayers appreciated! Peace and happy Friday eve to all! I like that you’ve done the rose from so many angles. Roses are quite intricate, sturdy yet also delicate, and you can really see that here. Aww, so kind of you, Johanna; I really appreciate it. The very best to your kitty Laura, I’m sending good thoughts your way. Good to see you are practicing your roses. Not always an easy flower to draw. I love Inktense! She did well today – we’re trying to get her to eat and drink more. And always fun to try and medicate a kitty! But we’re making slow progress at this point, at least. Thanks for asking, Jodi. OK, my sleep deprivation is kicking in – what I meant was we’re not looking to get any more cats anytime soon….even though as empty nesters, it will be sad with no animals or kids here. Sorry about the sick kitty…I’m gonna stop and say a prayer right now. Thank you, Melissa! I so appreciate your visit and concern. I’m seeing some improvement with Penny but at 16, I have to be realistic too. Thanks again. Good work with the roses. Sorry about your sick kitty.Please take time. Thank you, Kirk. I’m starting to see small improvements; I believe strongly in prayers and good thoughts and as long as her appetite improves, there is hope. Thanks again. I love the way you’re making these flowers! Wow! Aw, I hope your kitty cat recovers quickly and I will be praying! So sorry you kitty isn’t well. I’ll say a prayer for you and kitty. Thank you so kindly, Julie; I do feel they are working as I start to see small improvements. Thank you again!! …thank you for pointing me to the pen photo post! I let that one go by somehow. I do hope your lovely pet finds things getting easier. Thank you, Lance; I’m encouraged today by small improvements. With a 16 year-old cat, I have to be grateful for those. Thanks again. The roses look great. I’m sorry to hear about your kitty. Sending positive thoughts your way. Thank you Deborah; we truly appreciate that! Experimenting with various “art supplies” is always a lot of fun. I have an 18 year old kitty, deaf, dumb and blind, who always seems to bounce back. I think he’s on his twelfth life now. My heart goes out to you, for your sweet pet’s recovery! Thank you so much, Cynthia! I really appreciate that, and best to you and your kitty as well. They are such wonderful companions. Nothing beats the happy hum of a purring cat. Thank you so much, Ann; we really appreciate that! 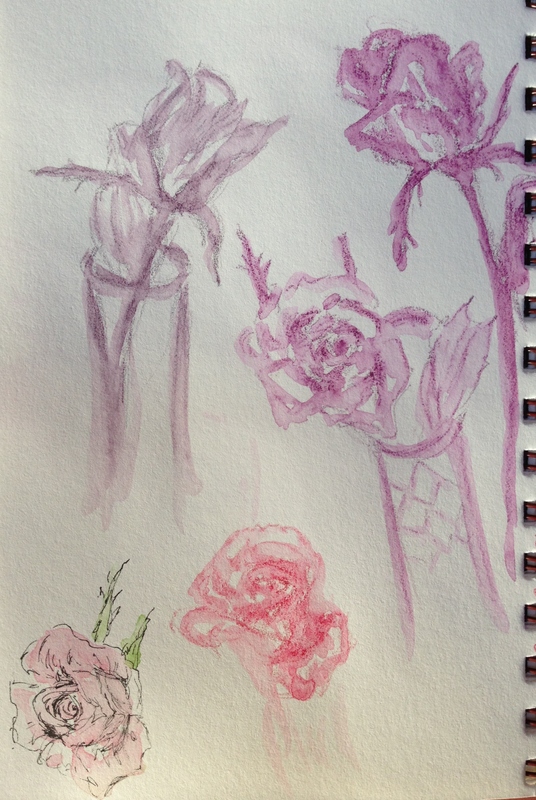 Very nice rose sketches, thank you for sharing during this stressful time. Prayers and positive thoughts for your Penny to feel better soon. Thank you so much! She is really eating much better now, so I feel encouraged. I believe so strongly in prayer, so thank you again! Laura! You really do just keep getting better and better! Just love the flow, and my favorite rose is the one in the lower left corner. It jumps off the page to me. The softness with the hard pen is just so intriguing. Thank you for you beautiful dedication to building your skill. You’re so inspiring! Thank you so much, BB! I do appreciate your encouragement and I’m so glad to be inspiring you and others. It really makes me happy. Thanks. Laura, I agree with BB’s comment, and I like the quote she included. I’ll say a little prayer for your kitty, I know how special pets are—they’re family. Thank you so much, Wendy. I do believe the prayers are working!! They are so powerful. I do appreciate it! Wonderful fluid feel to these sketches. Best for your pet, I know how special your cat is to you. Well done 🙂 Sending love to your sick kitty.